According to the Columbus Dispatch, Jim Tressel has resigned as the head coach at Ohio State. Assistant coach Luke Fickell will serve as the interim coach for the 2011 season. "I write to let you know that later this morning we will be announcing the resignation of Jim Tressel as head coach of the University's football program. As you all know, I appointed a special committee to analyze and provide advice to me regarding issues attendant to our football program. In consultation with the senior leadership of the University and the senior leadership of the Board, I have been actively reviewing the matter and have accepted Coach Tressel's resignation. "My public statement will include our common understanding that throughout all we do, we are One University with one set of standards and one overarching mission. The University's enduring public purposes and its tradition of excellence continue to guide our actions," Gee wrote. Fair or not fair, the storm of allegations surrounding the program were only going to get worse, and the writing on the wall was becoming more and more clear that something drastic needed to be done. Much more on the fallout about this soon. Stay tuned. Happy Memorial Day. Update: An article about Tressel by George Dohrmann, Pulitzer Prize winning writer for Sports Illustrated that was set to go live tomorrow at noon, will be posted late today/tonight. 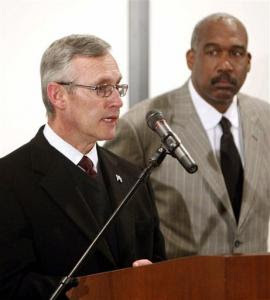 It is widely speculated that this article may have had something to do with Tressel stepping down...perhaps the straw that broke the camel's back. It has also been reported that this article will reveal the reason for the timing of Tressel's decision. As soon as we see it, we'll do our best to get a link to it posted here. I am traveling from Ohio (!) back to Michigan later this afternoon/evening, so we'll do our best.